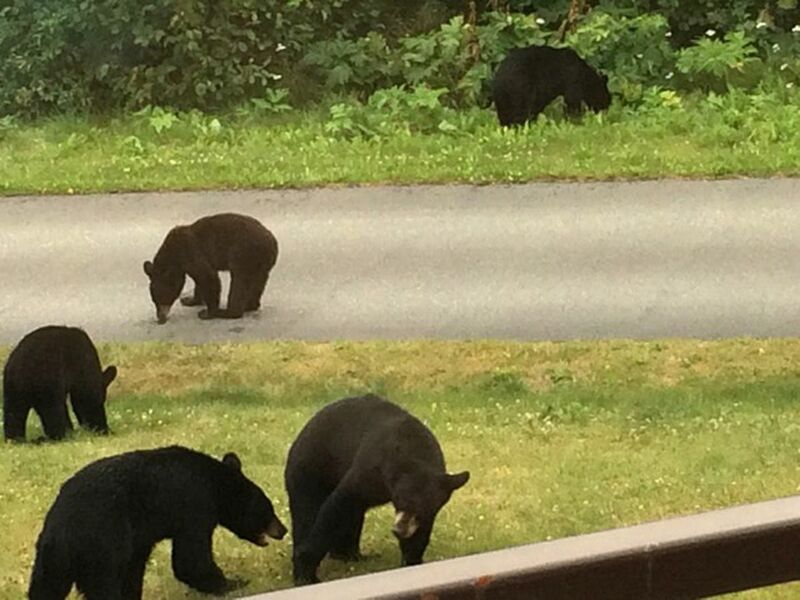 Six bears, one lawn: What’s going on in this Anchorage yard? Beverly Burns was doing laundry in her home on the Anchorage Hillside on Friday morning when she heard a munching noise coming from outside. Probably just another moose, she thought. She ignored it, she said, until her goldendoodle, Jackson, started growling inside. She glanced out the window. She saw two black bears eating clover in her backyard. Then two more bears came running around the corner of her house. About 30 seconds later, another pair of bears showed up. "All six bears arrived within a minute," Burns said. "I have to admit, I was pretty flabbergasted." Sure, Burns had previously spotted bears and moose in her yard — a grassy lot surrounded by trees near Goldenview Middle School. But she'd never seen more than one bear at a time. As the six bears ran to the front of her house, Burns yelled to her two children to look outside. 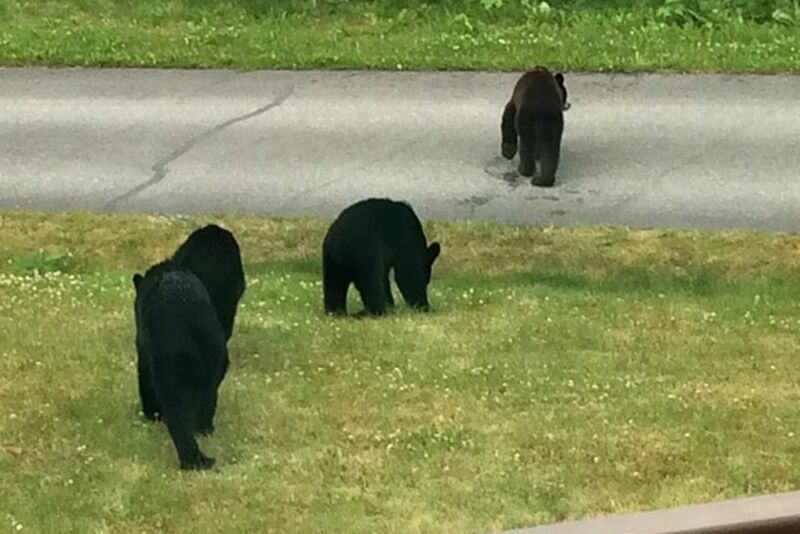 The three of them watched from a first-floor window as the bears ate clover and wrestled. Jackson continued barking upstairs. Burns said she grabbed her cellphone and started taking photos, capturing the images of five of the six bears just before they started to walk away in a line, into the trees. "I was so mesmerized watching all of those bears," Burns said, "I barely got the pictures." Burns emailed the pictures to the Daily News. She saw six bears, she said, five of them black and one a cinnamon color. She wondered why so many bears were traveling together around the neighborhood. Was it one family? If not, how did they group together? Here's what was most likely going on Friday, according to two wildlife biologists who had not seen the bears themselves, but gave their best guesses based on the photographs and their knowledge of bear behavior. Rick Sinnott, a retired longtime wildlife biologist for Fish and Game in Anchorage, said that Burns most likely saw an adult female black bear (a sow) and five cubs, probably around 1 1/2 years old. A sow typically has two or three cubs every other winter, he said. But on the rare occasion, a sow can have as many as four or five cubs in a litter. So it's possible the sow either birthed all five cubs or may have adopted some, Sinnott said. "One or more could've been adopted from another family, especially if one is cinnamon," he said. "A black bear can have a cinnamon cub and vice versa, but if the cinnamon is a little bigger or a little older, then it's most certainly from a different family group." Another possibility: Burns saw two sows, each with two cubs, and the bear families had converged on her lawn to eat clover — a tasty and nutritious bear meal, said James Wilder, a wildlife biologist with the U.S. Fish and Wildlife Service. It's not unusual for bears from different families to gather at an attractive food source. "It's the same with grizzly bears on a salmon stream or polar bears on a whale carcass," he said. Sinnott said Burns probably didn't see a group of unrelated cubs without a sow around. "The fact that these are sort of teenage bears, they don't form teenage gangs," he said. "This is definitely a family group or possibly a family group augmented by another bear." Fish and Game has received three or four reports this summer of at least five black bears traveling together in the Hillside area, said Ken Marsh, a department spokesman. Because of that, Marsh said, it's probably one sow with cubs instead of two sows. "We haven't had any complaints of the bears causing trouble or getting into trash," Marsh said. "They're just kind of hanging out."